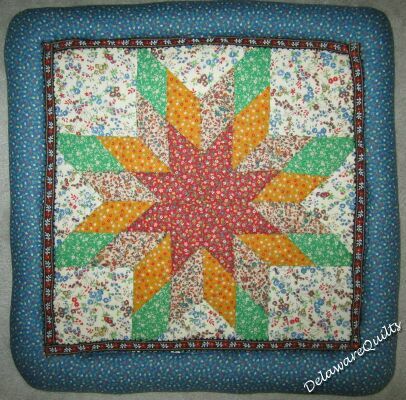 #1 I began quilting in 1974 while working at Minnesota Fabrics in the Washington DC area. The home economist was required to do a quilting demonstration and was looking for help. It sounded like fun to me, so I volunteered. The pattern I picked for my first ever quilt project was the Lone Star because we’d recently moved from Texas. This was pre-rotary cutters and I never heard of plastic for templates, I wasn’t real sure what a template was period. As soon as I realized I was over my head in skill level, I picked another pattern, a log cabin. That went quite easily, so I picked another one, a churn dash. Before the demonstration was held I had finished four different quilt projects, but not the Lone Star. The Lone Star wasn't finished until about a year later. Then I didn't know what to do with it, so I "framed" it. It was cool when I did it, not so much now, but I'm glad I still have it. It shows me where I started and how much I’ve improved. I made a few quilted pillows, then a baby quilt, and then more baby quilts.. and so on and so on. To say I was hooked was an understatement. I've been quilting ever since. I started teaching in 1983 when a friend asked me to show her how to make a Dresden Plate. Then I showed her friend, and then another, and so on. I "retired" from teaching in 2010 due to heath issues and now do all of my teaching on line and at the Retreats. Seeing a student's satisfaction when finishing a quilt gives me great happiness. I find more personal satisfaction teaching someone else to make a quilt than making it for them. However I am occasionally talked into making a quilt for someone. Links to My Quilts History pages. Here are two free projects to go with the first page in my quilting history, Trip Around the World and Trip Around the World scrappy version. A first in 1998 for me were tessellations. For this month's project I'm sharing an updated version of a tessellated baby quilt. I started making miniatures in 2001 and have made many since then for many different reasons. One of my favorite to make is Miniature Baskets, so I'm sharing that pattern with you now. Speedy Strips© was started when my son asked me for an "ugly" quilt when he went off to college in 2002, "You know Mom, one no one will want to steal." I saw it was a way to use up scraps, and it certainly did. I'm sharing it with the www now so we can use up some of those scraps we've created, and make some lovely but hardly "ugly" quilts! 2008-09 I decided to use my patterns in a new and different FUNdraising way for Relay For Life, and Mysteries For Relay was started. As a thank you for donations I offered a new quilt mystery every six weeks or so. 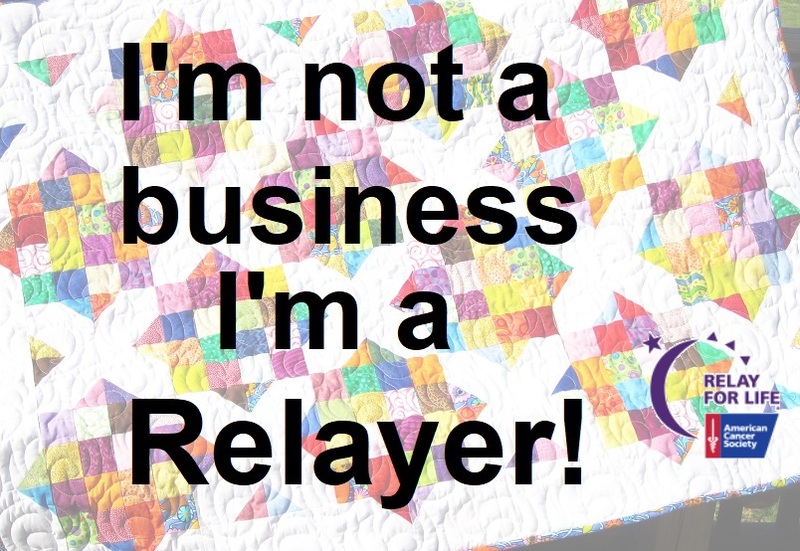 For eight years we made new quilts and new friends while raising a lot of money for the American Cancer Society (And the Canadian Cancer Society too.) Our first mystery project was Tessellated friendship stars.